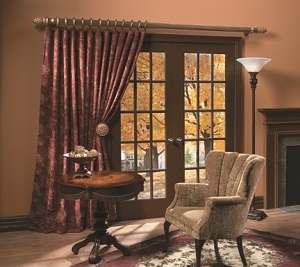 Completing the look of your customized draperies is part of what drapery hardware is all about. While it is true that most of this hardware is also functional, since it is often visible it is important to also have an attractive appearance. Make the mistake of putting little effort into details like drapery hardware in Charlotte, and your hard work choosing just the right window treatments will be undone. At Sweet Shutters and Shades, our Charlotte shutter company takes great pride in the fact that we are dedicated to helping our clients through every step of the process. This includes helping you better understand the options that you have, so that you can make better decisions. From curtain rods and end caps to the custom draperies that adorn your new drapery hardware, our job is to help you make sense of the project, through to the very end. Our company founder and owner, Diane Sweet, alone brings over 20 plus years of industry-related expertise to the team. We don't just know the window covering business, we are authentically passionate about it. Not to mention, we genuinely care about each of our customers, too. Drapery Arms – These condensed rods usually flank the window, as opposed to spanning all of it. Oftentimes, they are used for stationary draperies that are cosmetic only. Decorative Rod – Although this rod will be for a functional curtain, it should also be carefully selected because it will be visible. For keeping a cohesive and coordinated look, the drapery rings usually also match. Cafe Rod – The type of thin curtain rod, usually placed across the middle section of a window to cover the lower half. This is often seen in kitchens and holds a light curtain. End Cap - If your drapery rod butts up against a wall, this is the finishing piece you will use. It keeps the curtain rings from sliding off, but does not have to be attractive like a more visible finial. Finial – For rods and ends that will be seen, a finial is a decorative ornament used for each end. For all this and more, give Sweet Shutters and Shades a call. We are delighted to assist our clients with all their window covering needs, from finding the perfect hardware to creating custom draperies in Charlotte and the surrounding areas from our huge selection of fabrics and more. To get started with your window treatment project, right down to the drapery hardware, call on Sweet Shutters and Shades to get the job completed, in a prompt and professional manner. We look forward to providing you with the information you need, and the exceptional final results that you deserve. Don't delay, call today! If you would like to see samples of our drapery hardware in Charlotte, NC or the surrounding areas, please call Sweet Shutters and Shades at 704-980-4303 or complete our online request form.